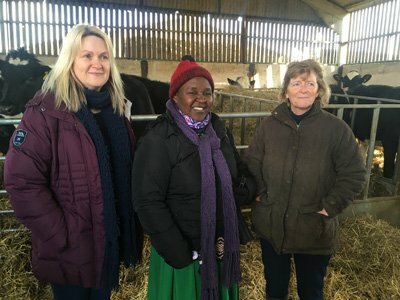 Last week, as we kicked off our Coffee & Cows campaign, we met with representatives of Fairtrade UK, who brought Ketra Kyosiimire, from the Ankole Coffee Producers’ Cooperative Union (ACPCU) in Uganda, to a Free Range Dairy farm in Gloucestershire. The ACPCU now represents around 9,000 coffee growers, supplying 17 Fairtrade certified primary cooperatives across the fertile mountains of south west Uganda. We had a roundtable discussion comparing the challenges faced by coffee growers in Uganda and dairy farmers in the UK. Today, there are over 1.65 million farmers and workers spread across more than 74 countries participating in Fairtrade. But, I wonder if you are aware that we are currently in the midst of Fairtrade Fortnight? Furthermore, what does Fairtrade and that little blue and green logo that appears on chocolate, bananas and coffee, mean to you? According to the Fairtrade Foundation website, “Fairtrade is a movement for change that works directly with businesses, consumers and campaigners to make trade deliver for farmers and workers”. Despite the efforts of organisations like the Fairtrade Foundation, it has become clear to me over the last 30 years that trade is often still unfair for those engaged in the primary production of agricultural commodities. The cost of producing milk on UK farms is widely estimated to be around 28 pence per litre, whilst the price farmers typically receive fluctuates from 25 pence to 30 pence, from year to year. Yet, we see very little change in the price of milk on supermarket shelves. Whilst dairy farmers here may not suffer the same degree of hardship as coffee growers in developing countries, they are exposed to unpredictable volatility in global dairy markets, which makes planning for the future very difficult. Dairy farmers at the bottom of the supply chain, are increasingly distanced from the people who consume their product and price negotiations are with those in the middle, seeking to profit from milk on route from farms to fridges, rather than those who ultimately enjoy and value the milk they produce. As our food supply is concentrated into the hands of fewer, larger food businesses, there is an urgent need to establish a closer connection between the farmer, the cows and those who open the milk bottle and pour. Over the past few days I have witnessed, in my own local community, the power of connecting farmers and consumers, working with great effect. I am fortunate to live within two miles of a Free Range Dairy farm selling Pasture Promise free range milk, through a vending machine at the farm gate. The snow in recent days has made driving hazardous in the surrounding villages and people have been unable to get to supermarkets in the local town of Frome. Unfortunately, even for those living in the town who managed to drive or walk to a supermarket, they arrived to find the milk aisles empty. 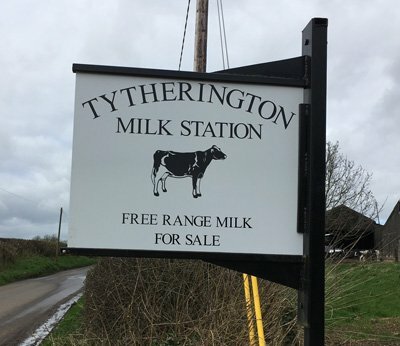 But thanks to the power of social media, we were able to spread the word that Tytherington Milk Station, a couple of miles outside the town, was open for business. 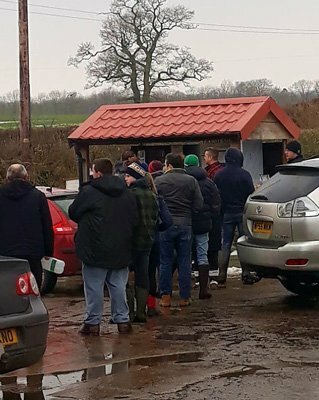 Scores of people made their way to the farm over the weekend, in 4×4 vehicles or on foot and queued to fill reusable glass bottles with the freshest, tastiest milk for miles around. You might argue, at a time when milk was scarce, people only made the sometimes difficult journey to a farm and paid £1.00 for a single litre of milk, out of shear desperation. But, in my mind, there is no question that the opportunity that the winter weather presented, will change the way some people think about their milk from here forward. The sights, sounds and smells of the farm yard, a chance to meet the farmer and his family, chatting with others queuing patiently in the cold and tasting milk that will caresses their taste buds with its rich creamy texture, will go a long way towards building that connection that farmers so badly need. Fairtrade works to help farmers overseas redress the balance of power in the supply chains, by raising awareness of the difficulties they face and promoting the quality of the food they produce and that is exactly what the Free Range Dairy Network seeks to achieve here. We want milk to be fairly traded in the UK, like coffee, cocoa, bananas and other goods, for the benefit of farmers, cows and consumers. But, not all of our Free Range Dairy Network farmers have the money to invest in equipment and sell their milk direct to local customers and we get a lot of calls from people in towns and cities, many miles from any dairy farms, who want to support traditional, family farms and keep cows in fields. So we need to build that connection, by giving people the chance to identify these farms wherever they buy their milk. The Pasture Promise logo on milk, provides that point of contact and connection through on-farm vending machines, doorstep delivery, local shops and larger retail chains. It represents a clearly defined farming system and tells people more about the kind of farms they are supporting when they buy milk. All milk that carries the logo is produced by farmers who are members of our network and who are committed to the tradition of seasonally grazing their cows at pasture, for a minimum of 180 days a year. Please support us to get closer to the farmers and cows that produce your milk and help us to establish fair trade for British milk.